Houzzers, we put out the call, and once again you answered. Your unconditional love for your pets shines through with the care and thought you've put into building things that make them happy. And your projects have also made your patios and yards more interesting. Get ideas from some homegrown responses to pets' love of the outdoors — and to the need to keep pets safe and comfortable. Have a look, then please share your own outdoor pet project. In Arizona’s hot climate, plenty of water for dogs is imperative. Houzz user Diane Way created this fountain from bored green granite and river rock, with underground circulating water that a sprinkler system freshens once a day. “Luna loves it, and it’s just her size,” she says. 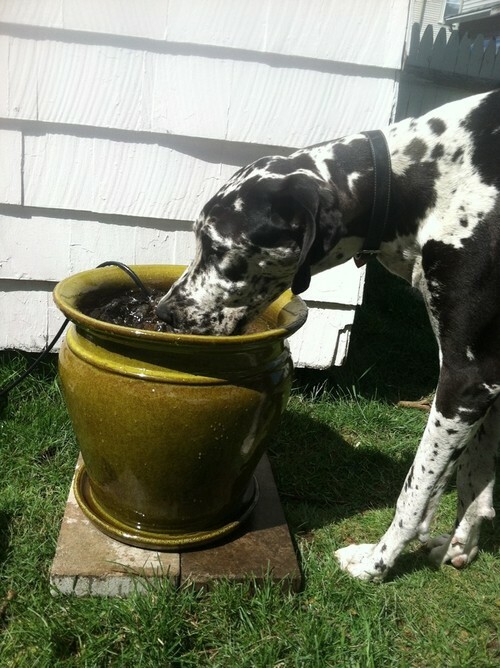 "After my two large dogs starting drinking out of my neighbors' birdbath on a regular basis, and seeing some great ideas on this site for dog-friendly backyards, I decided that I would make my own water fountain for them," says Houzz user katiek78. "I wanted something that I could afford and would circulate the water to try and keep things from growing in it." She fashioned the doggy fountain from a planter and a garden pond pump, and the dogs can't get enough. Everyone loves a porch, including Houzz user jkpp04's dog Oscar and his friends. The dogs spend a lot of the day outside and have a great shelter to enjoy. 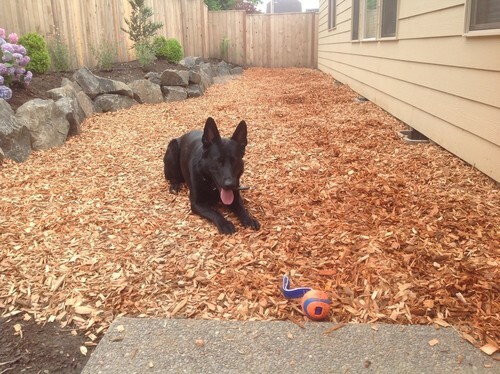 Houzz user osvold11 recently completed a dog-friendly backyard makeover. Oz has this fetching strip. There is also a sunning and resting spot for Pilar in osvold11's yard. 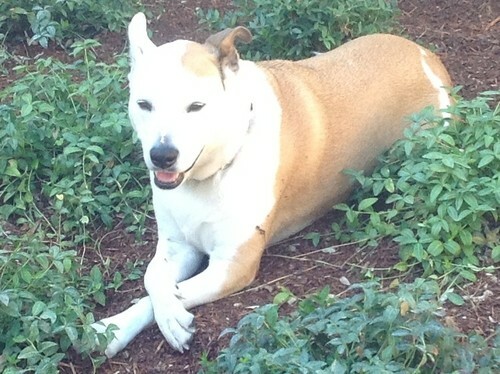 The yard does not have any lawn, and all of the plantings are tolerant of the dogs' doing their business and can recover from heavy pet use. 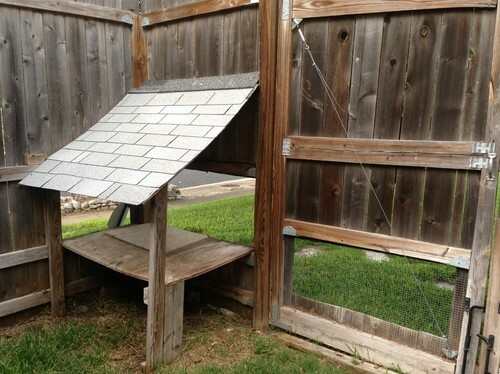 "To help our dogs, we built 'windows' into our privacy fence," says Houzzer Amanda Naughton. It has stopped one dog from trying to dig underneath the fence, and the other just enjoys checking out what's going on beyond the yard. "To help them with the neighbors' dogs, we put a window from our yard to their yard. Now our two dogs and their two dogs can sniff and see each other, so there is a lot less barking." The two windows in the fence gates were such a success, Naughton built the dogs a raised and covered corner area, called "the fort." When Houzz user dzanoff designed a garage with a guesthouse over it, a doghouse was included in the design. The exterior entry gives access to an indoor space underneath the stairs that includes a light, a raised bed and a heated water dish for winter. Visiting kiddos also like to use the dog space as a fort. 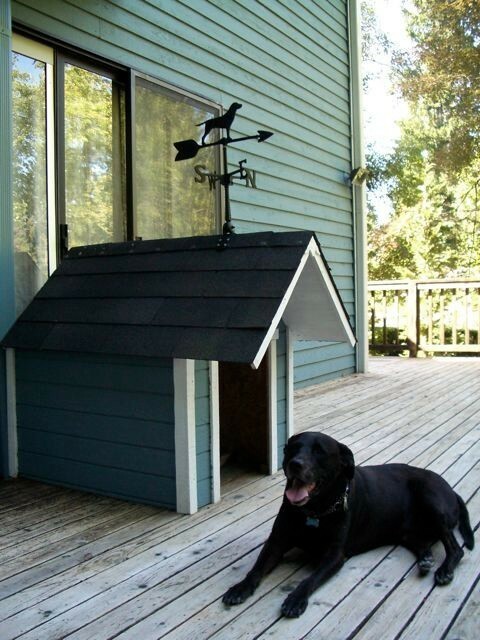 This little shelter was inspired by a garden shed on Houzz, and it even has its own dog weathervane. 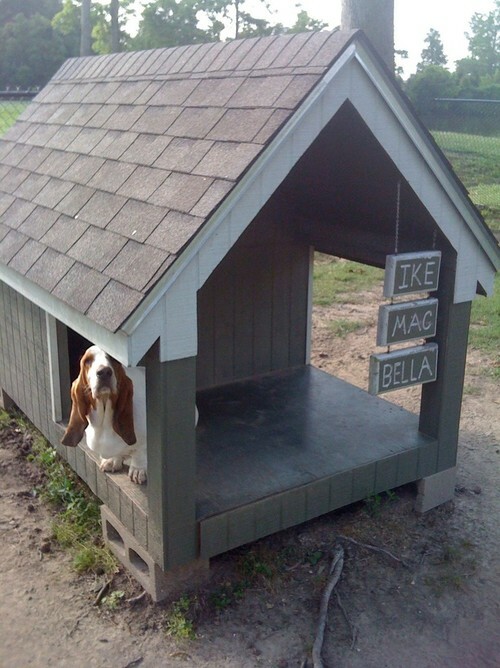 "I made this doghouse for my mom's two pups and painted it to match the house," says Houzz user Feels Like Home. The house also serves as a pass-through with a doggie door to the inside on one end. Inside is a carpet to wipe wet paws on, and the structure gives the pooches shelter on rainy Seattle days. Becky Harris currently lives in a 1920s cottage in Atlanta that she describes as "collected." She got into design via Landscape Architecture, which she studied at the University of Virginia. She has been writing about design online for quite a few years over at Hatch: The Design Public Blog.